We all get anxious, worried and upset about various things such as money, work, family, and love. Our heart starts beating faster, our breathing becomes shallow, and our minds may not seem to work well. At this point of time, all that one could wish for is to just relax! Whether you are experiencing just full-blown anxiety or you're just panicking, you may not want to try any medication as yet! There are many different types of natural anxiety treatment options. The term natural means treatment without chemical medicine which opens up hundreds of different doors that one can choose from to reduce or prevent anxiety in the natural way. Chamomile: If you're having a nervous moment, a cup of chamomile tea might help calm you down. Some compounds in chamomile bind to the same brain receptors such as drugs like Valium. Lemon balm Extract: It has been used at least since the middle ages to reduce stress and anxiety. While it's quite safe, be aware that some studies have found that taking too much can make you more anxious. It's important you follow directions and start with the smallest dose. Lemon balm extract is sold as a tea, capsule, or tincture which is often combined with other calming herbs such as chamomile. Exercise: This is safe and good for the brain. It is a powerful antidote for depression and anxiety, that works both immediately and long-term. One of the main causes of anxiety is worrying about health and illness and that can just dissipate when you are fit. Mindfulness meditation: This was originally a Buddhist practice but now, a mainstream therapy. Mindfulness meditation is particularly effective in treating anxiety. "By practicing mindfulness meditation, it allows one to experience the true essence of each moment as it really occurs rather than what is expected or feared says, Teresa M Edenfield, a clinical psychologist." Aromatherapy: By surrounding yourself with the right essences can help reduce anxiety. Lavender is said to be the most effective. 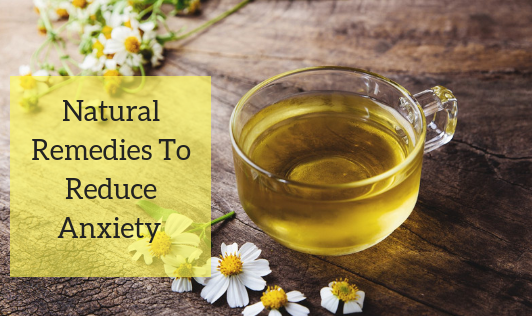 Other essential oils that can help reduce anxiety include rose, jasmine, and sandalwood. Remember, too much of anything is bad! Hence, it's important to keep things balanced. If your anxiety seems uncontrollable, seek medical assistance immediately.